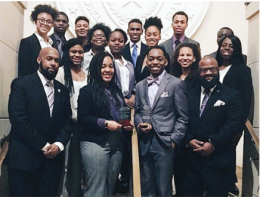 For the ninth time in 12 years, the university’s Black Student Union, or BSU, was awarded the Clarence Wine Award for Outstanding Big 12 Council of the Year at the 40th annual Big 12 Conference on Black Student Government, Feb. 16-18, at the University of Texas, Austin. “I could not be prouder of the hard work and dedication that our BSU continues to demonstrate year after year,” said Brandon Clark, program coordinator in the university’s Office of Diversity. • Maintaining, promoting and growing annual traditions, including the Welcome Back Barbecue in August for more than 20 years. • Connecting freshmen and new students with upperclassmen through the Black Student Union’s mentorship program. • Consistently inviting keynote speakers for Black History Month events in February. • Presenting these accomplishments and more in a clear and enthusiastic way at each year’s conference. • Alexis Cushshon, freshman in architectural engineering, St. Louis, Missouri, and president of the Black student Union’s Freshman Action Team, was honored with the Mickey Leland Award for Outstanding Community Service. • The Freshman Action Team received the Most Outstanding Freshman Action Team of the Year Award. • Bryan Davis, junior in management information systems, Topeka, and president of K-State’s Black Student Union, was elected as the 2017-2018 chair of the Big 12 Council on Black Student Government. Zelia Wiley, interim associate provost for the Office of Diversity, said the Black Student Union’s achievements show its commitment to welcoming and retaining diverse students at the university. 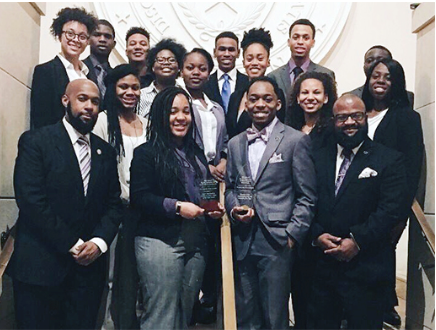 Delegates of Kansas State University’s Black Student Union at the Big 12 Conference on Black Student Government. As part of K-State’s comprehensive and proactive approach to encourage students to stay safe and healthy, K-State requires all students to complete the annual (July 1 – June 30) web based Alcohol and Sexual Assault Prevention Program (ASAP). K-State’s ASAP uses the Think About It series of modules from Campus Clarity© to address alcohol and other drug use and sexual harassment and sexual violence prevention through interactive educational content and scenarios. Undergraduate and graduate students (21 and younger) enrolled in their first term at KSU receive the “Think About It: Part 1” training. Undergraduate and graduate students (21 and younger) enrolled in terms two and beyond receive the “Think About It: Campus Save” training. Adult learner undergraduate students (22 and older) receive the “Think About It: Adult Learner” training. Graduate students (22 and older) receive the “Think About It: Graduate Student” training. Program to reduce risky student behavior and prevent sexual assault on your campus. Director of Parent & Family Relations Mindy Weixelman sat down with K-State Career Center Executive Director Dr. Kerri Keller in her office to learn the latest news about career development resources available to K-State students. Mindy: Thank you so much for meeting with me, especially late on a beautiful Friday afternoon! Kerri: The Career Center enjoys the partnership we have with parents, so I’m glad to visit with you. I think I have information that will benefit parents and families. Mindy: Yes, you do! Let’s jump right in. We know that most parents send their student to college because they want their student to get a JOB. Tell parents and families about the K-State Career Center and your team of staff. Kerri: The Career Center facilitates the career readiness of all students throughout the K-State community. We help students explore majors and careers, develop their potential through internships and career-related experiences, tell their stories through their resumes and interviewing, and connect with employers and other opportunities. Each student has a friendly and knowledgeable Career Center advisor who works with their college and is available for in-person appointments, classroom presentations, email consultations and more to help your student. Mindy: You have such a talented staff. I completely agree that they are friendly and knowledgeable. I would also share that they have a reputation for being very effective with employers and students. I think it’s important for parents and families to understand your role at the Career Center. Give us a feel for what your role includes. Kerri: As director of the Career Center, I provide leadership and overall management of our department. I am fortunate to work with a committed, hard-working and enthusiastic team of nearly 50 full-time and student employees. I see my job as being similar to an orchestra conductor – I’ve played several of the instruments among our group but my goal now is to help everyone else be the best at their part so that we can create a powerful career services harmony – one that is music to the ears of our students, families, employers and others within the K-State community. Mindy: I love that answer! I think a lot of people can relate to your analogy of an orchestra conductor. Do you hire student employees at the Career Center? If so, can you provide some examples of how student employees advance the work of the department? 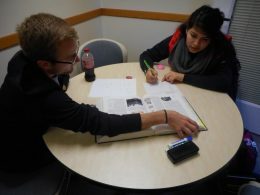 Educational Supportive Services (ESS) is a FREE service that helps first-generation, low-income and disabled students earn undergraduate degrees. ESS students can take advantage of one-on-one tutoring, peer mentoring, workshops (academic, financial, career, etc. ), and more—all designed to make sure students improve academic success, graduate and achieve their life goals. ESS is funded by a federal TRIO Student Support Services (SSS) grant. Do you know a student who would benefit from this program? For more information: Call (785) 532-5642 or visit Educational Supportive Services. The Ronald E. McNair Baccalaureate Achievement Program (McNair Scholars Program) prepares talented under graduates for graduate study, with the goal of increasing the number of Ph.D. recipients from underrepresented socio-economic and ethnic groups. The hallmark of the program is its Summer Research Internship where students conduct original research, report their finding, write an abstract, and present. Additionally the program provides classes, colloquia, advising, tutoring, and faculty mentoring to support academic success, assist with completing the application process, and preparing students for the graduate study environment. The McNair Scholars Program is a TRIO program funded from the federal Department of Education. For more information: Call (785) 532-6137 or visit McNair Scholars. 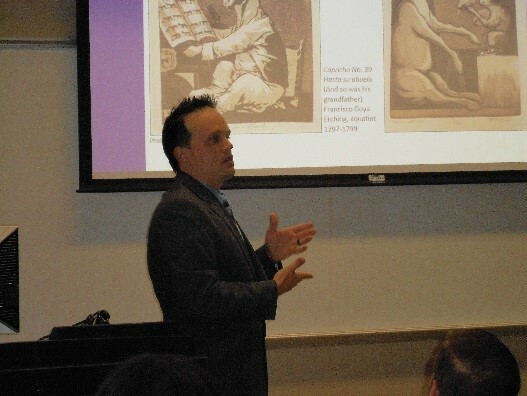 McNair Scholar presenting at the Heartland Research Conference on September 23, 2016.